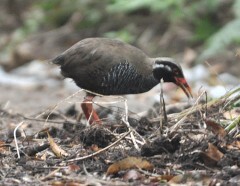 On April 5 at Sosu in Kunigami, an Okinawa rail pecks at a worm on the road. In the afternoon of April 5, photographs were taken of an Okinawa rail, a national natural treasure, looking for food on an old road in the Yambaru forest in the northern part of Okinawa. Wild birds in the Yambaru forest are now entering their mating season. The photographs were taken on a side road just 50 meters off the old road facing Prefectural Highway 70 at Sosu in Kunigami, which is an area designated for accident prevention. The bird was pecking away at a worm in dirt piled up on the road.